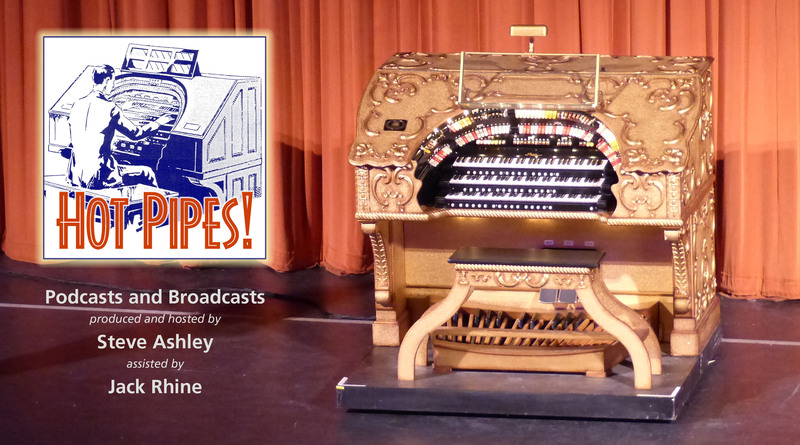 Hot Pipes Podcast 96 – mp3 – That’s an unusual place for an organ! Can’t download to I tunes yet. keep getting “you do not have sufficent permissions to access this page” I can listen to program 168 but not save it to my Ipod. Ed, have you changed the feed addresses? The old ones will not work. The new addresses are at the bottom of the right hand panel on the website pages. You will need to unsubscribe from the old feeds and re-subscribe to the new ones. Sorry about that! great side, One of my favourite organs is the mighty Moller, however I liked it more as it was voiced. I agree not the best as a theatre organ but so unique! I had Richard Hills over to Leeuwarden in the Netherlands to play the Standaart organ when he was only 16. We had always the well known names like Bill Davies ,Arnold Loxam, Armsbee Bancroft, John Mann, Douglas Reeve, Nick Martin etc over. I thought time for some new talent. I thought he was a great talent and he could come over if his grand parents came over too !!!! If you listen to him playing at the mighty Moller at the Atlanta Fox you know I was right to have Richard over. This organ sounds still as the old big ones did, sorry I don´t like the voicing of many of the new installations. A few months ago the Standaart was taken out and is likely going to the …………..Ukraine or that area. I will have another listening to Richard at the Fox…………………..! Thanks for your feedback, Tony. Not having heard the Foort Moller in any location other than the Pasadena Civic, I can’t directly compare the sound. But I have to say that the organ in its current location is spectacular. Apparently it brought tears of joy to Reg Foort’s eyes at the Pasadena opening, with the comment along the lines of “That’s how I always wanted it to sound”. Sorry, which Standaart are you saying was removed? I wasn’t aware of one in Leeuwarden. And going to eastern Europe??? The organ in Leeuwarden was put in the church in 1936. Bits of came from an earlier installation in a cinema in Schiedam. The organ was bought by the father of a great friend of mine Taco Tiemersma. In the early days it was used as church organ and not as theatreorgan! When Taco started to play and heard names like Dixon, Foort and Cor Steyn he thought that will do the organ in church too. So he made sure nobody was in the church , specially his father, and then had it playing with all trems on and it sounded fantastic. When he became the resident organist of the church he played it more and more like the theatreorgan. Many people went special to that church for the organ. When I met Taco we agreed to have concerts and many great names played the Standaart. In 1995 when Taco was 40 years organist the organ got a new console and a great concert by Arnold Loxam and a 25 men orchestra. When Taco died in 2002 the organ was some times used by a churchorganist………..horrible. It had 10 ranks. Taco also had a 3-7 Standaart at home, designed for radio Luxemburg but instead they got a hammond. The organ was sold to a well known cafe-night club in Leeuwarden. When the owner died Taco bought the organ and it was installed in his house. This organ is now in a hotel but not often used. Taco was well known in the organ world and he wrote often with Dudley Savage , also for requests at his radio programme. Imagine how difficult it was for Dudley to say Taco Tiemersma from Leewarden. A great emotion moment was when I invited Dudley to play the mighty Standaart, a dream from Taco came true. Also a few days later I took Taco and Dudley to Germany to play the mighty Compton from Ralf Krampen. Also did a recording with Dudley on the Compton later. Thanks for that background, Tony. That Standaart is new to me: were there ever any recordings made?